After the children’s home forgets his eighth birthday, he runs away. As he gets farther from his home and safety, Hamelin discovers that he is being summoned by the Ancient One and that his story is part of a great struggle between worlds and kingdoms, where the old myths of magic, evil contracts, and enslaved children longing for freedom turn out to be real. THE PILLARS: Dr. Sloan, you have written a novel. Tell us about it. DR. SLOAN: I have written the first volume of what I hope to be a three-volume trilogy. It’s a young adult fantasy, and the idea is to tell a great story – one that will appeal to young teenagers, middle teenagers, and hit right in the sweet spot of their interest. I hope that it also does some shaping and some teaching along the way. THE PILLARS: Give us the title and synopsis. 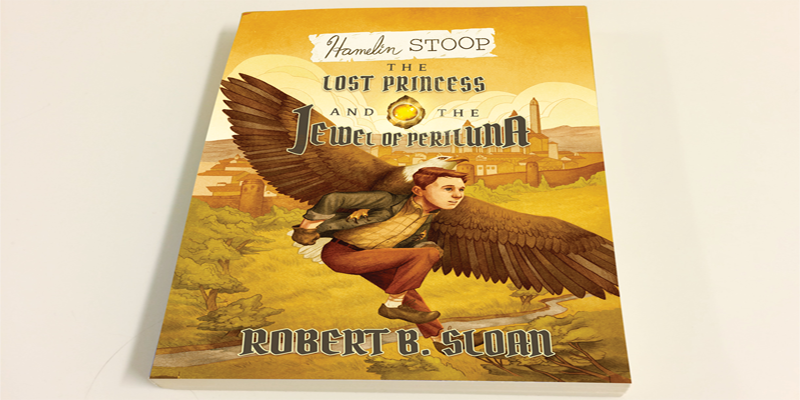 DR. SLOAN: The title is, Hamelin Stoop: The Lost Princess, and the Jewel of Periluna. The main character is Hamelin Stoop, and how he gets that name is part of the story. He has been left on the steps of an orphanage in Southwest Texas in the 1950s. Thus, begins his adventure of finding out who he is, and it is the age-old question of identity. Identity is a very basic and human question. What’s your name? Who’s your family? Where are you from? Those are just the basic human questions and, obviously, to know says a lot about yourself. Along the way, Hamelin meets up with some interesting friends and goes into another world to look for a lost princess and to recover a very precious tool, so hence the title. THE PILLARS: Give us the history of your writing. DR. SLOAN: For me, I have always had the desire to write stories, even in grade school. Then, while in my twenties, I read the stories of C.S. Lewis and fell in love with the The Chronicles of Narnia and Lewis’ Space Trilogy, and then read the novels of Charles Williams, which were supernatural thrillers. Of course, J.R.R. Tolkien and The Lord of the Rings, The Hobbit are the kind of stories I loved. I recall reading that C.S. Lewis said he wanted to write the kind of stories that he wanted to read. This is the story I loved to read, so that is at least my own personal history for it. THE PILLARS: How long did it take you to write The Lost Princess, and the Jewel of Periluna? DR. SLOAN: I took a long time to write this volume. I started it over 10 years ago. I had just left Baylor, and was on a study leave and thinking about what the next steps would be for the Lord’s leading in my life, when I had this deep impulse to start writing. Writing young adult fiction has just always been on my bucket list. I started writing the book in 2005. I’ve written many articles, sermons, technical articles, and popular articles, so I thought this would be easy to do, but it wasn’t. I found out I didn’t know a thing about writing fiction, which is a different animal to itself. So I started reading about writing, and it took me a long time. THE PILLARS: Is there any significance to the Lone Star State being the geography? DR. SLOAN: Probably the only significance is that this is where I was raised. I am writing about places I know, but every person is completely fictional. You have to be able to describe the scene and know a place when you write about it. Some authors go to that place, or to places like it, if it is fictional. You have to build up a sense of place. I found that to be very important, so I wrote about something out of west Texas or southwest Texas, something that I knew a little bit about. THE PILLARS: Although it’s young adult fiction, I’m sure people of all ages will benefit from this book. DR. SLOAN: I think so. The truth is, young adult fiction is widely read by adults. The Harry Potter books are young adult fiction, and of course the various vampire books, and the love stories that are out there now. These are so called young adult fiction, but are widely read by adults. THE PILLARS: How can people get a copy of your book? DR. SLOAN: It will be available through our website RobertBSloan.com and various other outlets like Amazon. We are still negotiating with some of the distributors now. THE PILLARS: What is the strongest takeaway of the novel to you? DR. SLOAN: For me, the strongest takeaway is the underlying mythology. It is the underlying story that I have tried to shape in such a way that, while it is not the same thing as the biblical story, it has a lot of resonance with it, if that makes any sense. Probably the biggest takeaway has to do with the characters and their friendship, their sense of mission, how they can not accomplish what they are supposed to accomplish unless they help each other. It is a story that has a lot of themes of loyalty, sacrifice, strength, courage, and failures – how to do something that’s not just your own private mission in life, but actually part of a larger story, a larger mission, and purpose in life.